"We Are the Business Leaders in Automation Testing Services in Australia"
Every time, when a modification to the software code is made, it needs to be tested rigorously to ensure flawless and utmost functionality. Automation Software Testing is a comprehensive quality assurance methodology which ensures the compliance of a software system against its functional requisites to ensure correct functionality, but instead of carrying out the tests manually, the testing is carried out using automated test cases. We design and leverage the most advanced software systems for automating the highly repetitive test cases to provide unmatched testing coverage over the core business processes. It significantly reduces the time and cost required for testing while ensuring accuracy. KiwiQA is a leading automation testing company in Australia and a market leader in providing exhaustive automated testing services and excels in designing the best automation tools for carrying our consummate software testing. 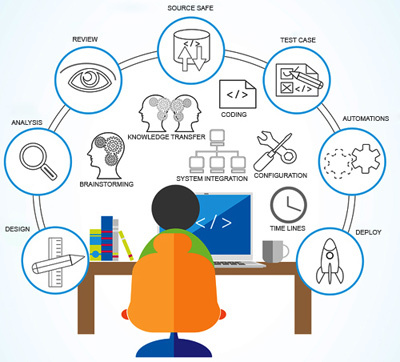 Automation Testing services lie at the core of our matchless testing strategy which we leverage for digital transformation, extending to the comprehensive end-to-end automation for the testing ecosystems. We also offer expertise oriented mobile automation testing services to our global clients. We, at KiwiQA possess vast experience across diverse industry verticals in performing exhaustive functional testing. With a broad portfolio of automation testing services, we offer the best test automation services aimed at driving down the testing cost while extending support for accelerated software release cycles. We, at KiwiQA understand the significance of performing profound testing to ensure faultlessness and thus, emphasise on accelerated testing to enhance the effectiveness and efficiency of automated testing. We deploy the most advanced testing tools and techniques to identify any defects in the system functionality.